Barry Richards did a side by side comparison with David Warner's blade in 2015 and probably felt he might have made 325 more for South Australia in Perth in the Sheffield Shield in 1970 if the weight on his bat had translated into more bulk. Long before bats were weapons that had their own metrics, they were plain, modest pieces of willow, tastefully augmenting the monochrome aesthetic of cricket - until the sticker came along. The colours of destruction are red and turquoise blue. When Gray-Nicolls first released the Scoop, the sticker was the width of the grip, on the front and back. The blockbuster feature, of course, was the scoop itself - a groove in the back of the bat where the swell would normally be, 1.17 inches deep, designed to be located an inch and a half below the splice and an inch from the bottom. In this groove was a red sticker, so if used with a red grip, the back of this bat looked like a scabbard holding a red sword. 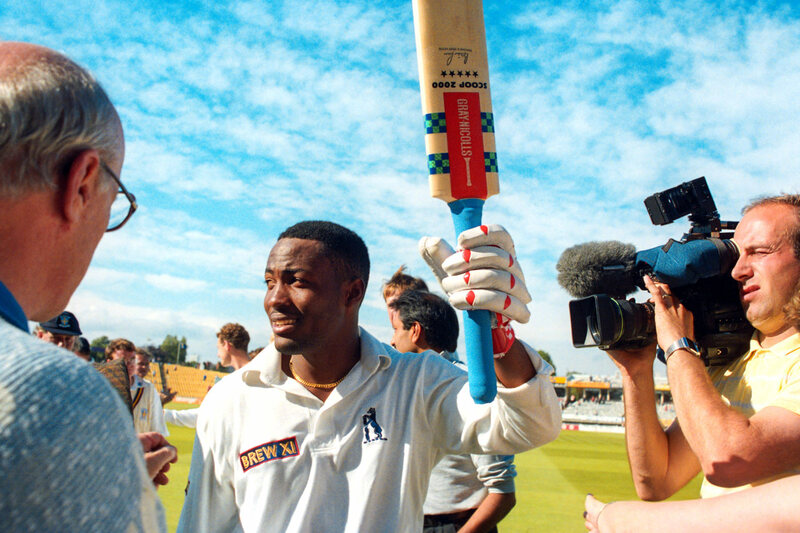 Lara scythed his 375 with the Scoop in Antigua in 1994, although it seems it wasn't the batmaker's premier line of bats that season. Lara's Scoop, unlike the original, had my favourite pattern on a Gray-Nicolls bat - two checkered turquoise blue strips extending outwards and around from the logo panel. It was the perfect palette: the maroon of the panel complementing the West Indies helmet, and the blues in sync with the West Indies crest. Lara's blue grip made up for the absence of the crest two months later when he made 501 not-out for Warwickshire at Edgbaston. This is pure sentiment. When I went to pick out my first bat as a ten-year-old, I hadn't seen too much of Bevan. Did I know of him? Sure. The man with the highest ODI average, and consistently the best trump card to have in your deck. Would I have bought the bat that contributed to heartbreak for my beloved Zulu in '99? Never. But I didn't know. And Bevan's Puma was the only one for me after I saw it at the store. An alluring rich, red insignia, with transparent edges that heightened the willow's caramel hue. The grains seemed to be extensions of the lines that surrounded the leaping feline predator in the logo. The bat I had was a slight variation on Bevan's - the lines were black, not green like they were supposed to be. Also missing was the gold "Millichamp" ribbon above the logo. These should have been the signs it was counterfeit, but I didn't know till the first net session when we all heard the hollow, tinny clunk of leather ball meeting substandard bat. I moved on to the BDM Admiral Jumbo, with my non-Puma relegated to tennis-ball cricket, where it was the glittery protagonist in many successful chases. It remains the prettiest bat I've ever owned. 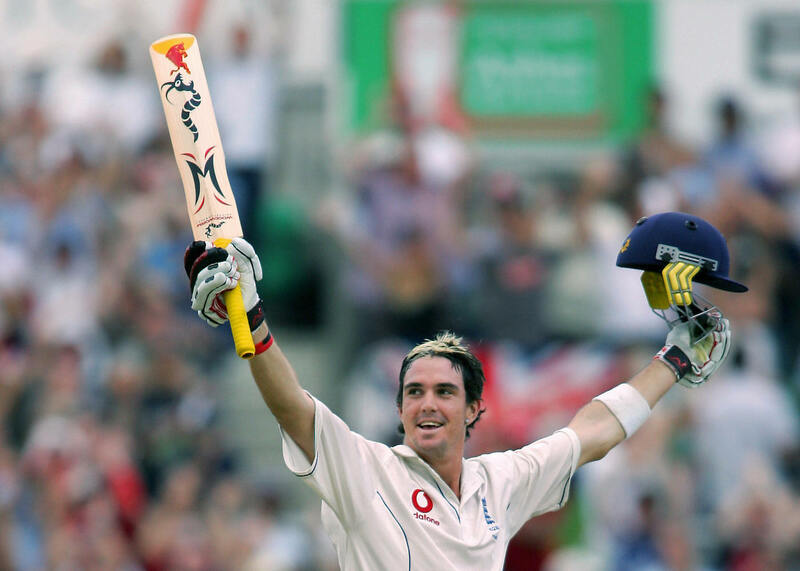 Specifically Pietersen's yellow Woodworm Torch from his first series, the 2005 Ashes, with a slim, yellow, stump-shaped sticker running down the front of the bat, squeezing inwards briefly near the middle where the bat's edges are concave. Where the edges squeezed inwards, so did the big "W" on the front. All this plus a worm infestation: two little ones at the top - front and back - and a giant one running along the lower half of the spine. It was radical, and apt for Pietersen, who brought this bat down at angles Glenn McGrath couldn't figure out during his debut fifty. KP's Torch was the beacon for many young cricketers - come, it said, let us travel well in front of the body, and fetch this ball from outside off to the midwicket boundary. Pietersen was a true modern rock star, with equipment that could only have only belonged to him. Perhaps the one thing that would have made this bat cooler was if it was called the Wand, like the black Woodworm variant that Andrew Flintoff and Russel Arnold, among others, used. For me, Kookaburra was anathema for the most part, thanks to many years of seeing Sanath Jayasuriya mercilessly scythe India with a Bubble. It had a lot going on as well - red and blue and white curves on the front, with an almost indecipherable kookaburra on the front sticker. The makers seemed to move away from that format in the 2000s, abolishing thin, rectangular stickers altogether and putting the bird from the logo at the centre, with minimal strokes of colour around it. They briefly reinforced the bats with graphite, and put flashy art on them - remember Ricky Ponting's Kahuna? - but the MCC didn't let that experiment last long. These days the bats have the same minimal front, and the backs have large, glossy stickers that are nevertheless tasteful because of the understated colours used. On the Surge Pro, they are a light blue hue à la tropical tourism ads. 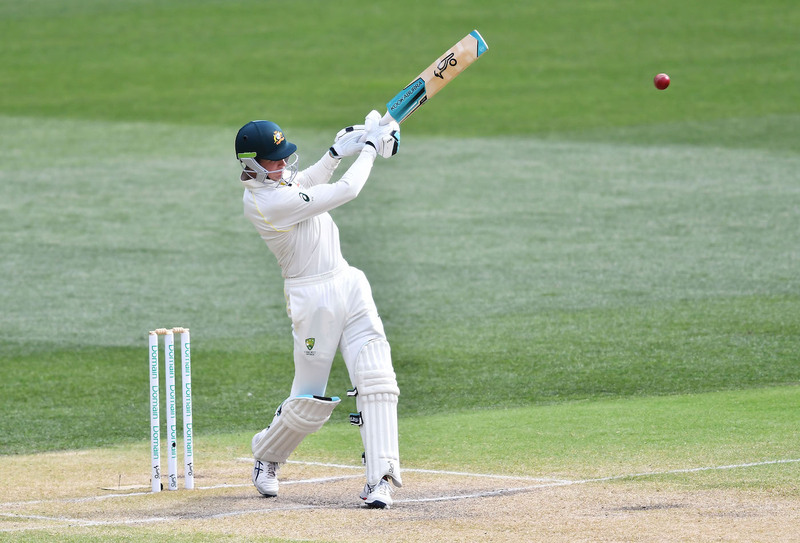 I first spotted the Pro in the hands of Handscomb, and more recently saw it being used by New Zealand's Tim Seifert. Its introversion, despite the bright hues, is appealing, and the black streak on the back sticker creates a stunning gradient. A shout-out also to the limited edition Indigenous Round stickers Dan Christian used in the Big Bash League this season to honour his roots. This is my new No. 1, from the women's World Cup in 2018. These bats were a recent discovery; I first spotted Rodrigues using them, and was pleased there was a new company making old-styled bats - a reversal of what Gray-Nicolls did in the '70s. 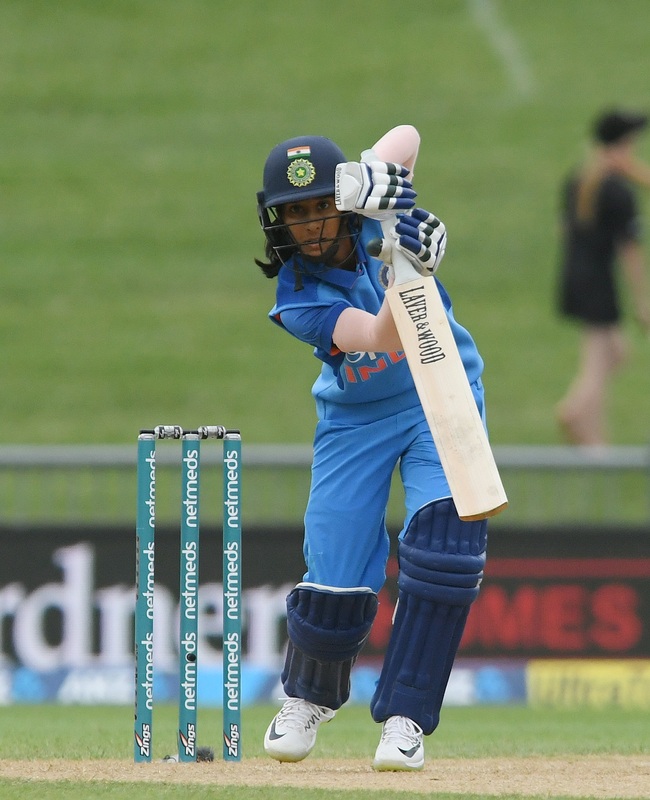 Rodrigues and a few other women cricketers use what looks like the Laver and Wood Conqueror. The bat is conspicuously plain: no colours whatsoever, just the words "Laver and Wood" running down the top of the front, contracting and then expanding across the face. No background on the branding too, just pure, grainy awesomeness from the willow. Laver and Wood is not a new company. They have been in bat-making for nearly two decades and have made bats for some of the aforementioned illustrious cricketers (who, of course, had to slap their sponsors' stickers onto these bats), and also Sachin Tendulkar. Whether intentional or not, the design allows you to notice clearly the beauty of the bat's contours, particularly the eccentric swell and the perfectly finished toe, places that are normally covered in branding. In the era of fluorescent stickers, the Conqueror is a bat-maker's revenge. How did a company in a one-street Kiwi town become a bat-making powerhouse?